This is the top 10 list to review before shopping for a diamond and discover how you can get good value for your money. Almost all diamonds are rated by either the GIA or EGL. Try to find a reputable broker to save on the retail markup or buy online from a diamond wholesale distributor. Most retailers at the shopping mall have a poor selection of high quality diamonds. 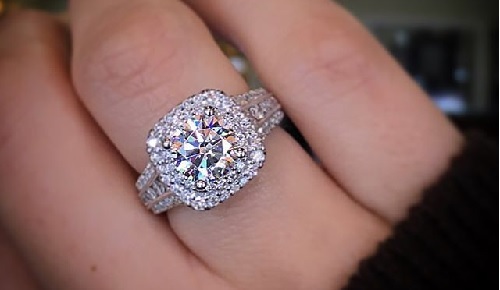 Diamonds in the 1 carat range are disproportionately more expensive due to its popularity for engagement rings. Look for something in the .9 carat range if you are looking to save some dollars. For more information, you can read this article on deriving the price of diamonds using some simple Math and data compariso. If you see a diamond sold online that seems to be better priced than others with the same colour and clarity ratings, most likely the cut is not ideal. Diamonds of the same carat weight can appear much smaller based on the proportions of the cut. The larger the table or “face” of the diamond, the bigger it appears. If the table is too large percentage wise, it is not good also because less light is refracted and the diamond has less fire. Diamonds with clarity of SI1 and above are usually free of inlusions to the naked eye. Great deals are to be had for SI1 clarity grades if you can find diamonds that have inclusions on the bottom or diamonds that can have the inclusions hidden by the ring setting. Diamonds that D, E and F in colour are hard to distinguish unless places side by side. They are all considered colourless and can really only be distinguished if placed near each other or on a piece of white paper. Please refer back to the 4 C’s of diamonds page for the chart. The Round Brilliant shape is the only diamond where exact proportions of the ideal cut have been pretty well determined. This shape is also the most popular and it also appears larger than other diamond shapes with the same carat weight. Princess Cut diamonds are roughly about 20% smaller than an equivalent Round Brilliant Cut of the same carat weight because more of the rough diamond is removed during cutting. Hearts and pear shaped diamonds have even more of the rough diamond removed. Some important proportions for the ideal Round Brilliant Cut listed are Table 56%, Depth 59.3% to 62.5%, and Girdle 1 to 3% of diameter. 7 ) Eco-Friendly and Blood Diamonds? What are they? Diamonds mined from Canada are eco-friendly and are better for the environment because of the business practices used in mining. Blood diamonds are diamonds mined in countries where the proceeds from diamonds has come from or is the result of war, human rights abuses and environmental damage. It is hard to really know if a diamond is conflict-free, so unless it is mined in Canada, don’t pay the premium for conflict-free natural diamonds. Diamonds mined from the Earth and diamonds made from a lab are identical in their chemical composition. Synthetic fancy diamonds are lab-grown and are real diamonds. Celebrities are already wearing these synthetic diamonds and they are guaranteed to be conflict free. Currently, it is difficult if not impossible to find a large clear synthetic diamond. Diamonds that have an extremely thick girdle have a poor cut as some of the diamond has been wasted resulting in a smaller “face” and appearance of size. Diamonds with an extremely thin girdle are prone to chipping and damage unless it is paved or protected by the setting. Diamonds are not any different if bought from a broker, online or from a brand name jewelry store. Find a reputable broker and have an appraiser double check the GIA report to see if it matches the diamond. Unless you are buying online, always look at the diamond under 10x scope to see where the inclusions are as well. Many custom jewelers can make settings similar to brand name styles.